As we keep our homes nice and warm throughout winter we now see fleas all year round. Only a small part of the flea population (5%) actually lives on your pet, the fleas’ eggs and larvae (95%) live in the environment and can survive for up to a year, so it is important to not only treat your animal directly for fleas but also decontaminate the environment as well. Wash your pet’s bedding using the hottest cycle and regularly vacuum/clean carpets. Dogs and cats can have a reaction to flea saliva resulting in a skin condition called Flea Allergy Dermatitis or FAD. Treatment of FAD can be complicated and veterinary consultation is recommended. Warning: Some brands of flea treatments for dogs are potentially lethal when applied to cats. Always seek veterinary advice about the best flea treatments for your pet. 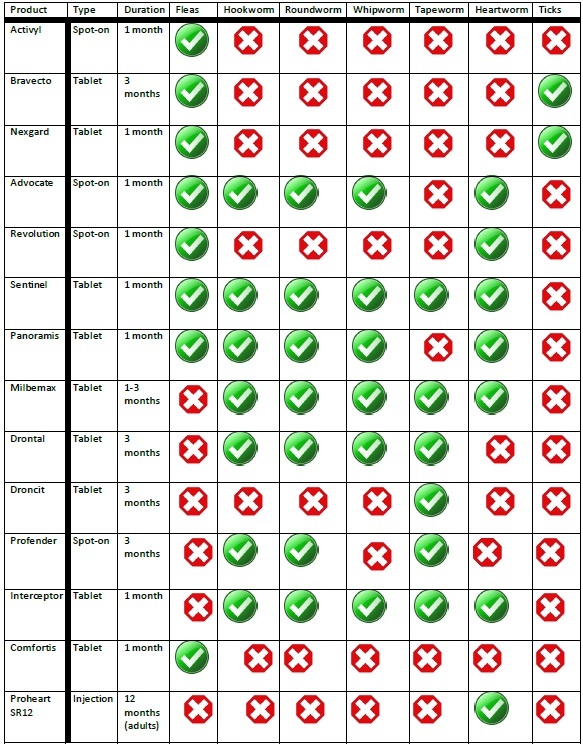 Most flea treatments are in the form of a spot-on, given monthly- see the table below. Worming is one of the first health care issues pet owners need to address as pups and kittens are the most susceptible. 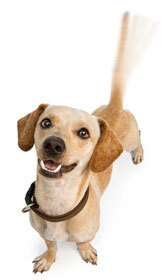 As their name suggests, intestinal worms are parasites that live inside your pet’s intestines. If your pet has a large number of worms it may find it difficult to maintain body condition and it can lose weight. It is important to maintain a routine worming treatment for your pets, to reduce levels of infection and to reduce environmental contamination. Re-infection is a common problem, particularly in pets that are in contact with a heavily contaminated environment. Another very important reason to worm your pets is to protect your family; as children in particular can become infected with certain dog and cat worms. Most wormers are in tablet form, but spot-ons also exist. See the tablet below for guidance. Heartworm is a parasite that is spread by mosquitoes so you pet does not even need to be in contact with other pets to become infected! As the worms mature in the heart they can cause a physical blockage. In the earlystages of infection there may be no visible signs, however, infection may eventually lead to signs of heart failure (reluctance to exercise, lethargy, coughing) and even death. Heartworm is present throughout most of Australia (except Tasmania and arid areas). Thankfully, heartworm is very easy to prevent and should form part of your pet health care routine. We have very effective preventative treatment options available including tablets, chews, spot-on's and even an annual injection for dogs administered by one of our vets (see table below for more information). If your pet has not been on heartworm prevention we strongly recommend a heartworm test prior to starting a prevention program, followed by a repeat test 6 months after commencing. The main tick of concern for pet owners is the Paralysis Tick (Ixodes holocyclus) as it can cause paralysis and death within 2-4 days of attachment. Whilst Paralysis Ticks occur naturally only in certain geographic areas (mainly along the coastal eastern seaboard of Australia) they can attach to pets who visit these areas during the warmer months and are being reported more in Victoria including in the inner suburbs of Melbourne. If you notice a tick on a pet that is not displaying signs of tick paralysis, remove the tick straight away. It is better not to try and kill the tick first as the dying tick may inject more of its potent toxin into your pet. If you are not confident removing the tick please call us immediately to make an appointment to have it removed. Please call us to discuss the best tick prevention for your pet. Parasite prevention can get pretty confusing- here's a ready reckoner to help you navigate through it all.